Looking for a different Hogans Heroes series? Hogan's Heroes is an American television situation comedy that ran for 168 episodes from September 17, 1965, to July 4, 1971, on the CBS network. Starring Bob Crane as Colonel Robert E. Hogan, the show was set in a German prisoner of war (POW) camp during the Second World War. The program featured Werner Klemperer as Colonel Wilhelm Klink, the commandant of the camp; John Banner as the portly inept sergeant-of-the-guard, Schultz; and a crew of Allied prisoners who assisted Hogan in running a Special Operations group from the camp. The front of each card features a white border, with a clever pun or quote in black letters. Within the black and white panel is prominent red Hogan's Heroes logo as well as a red WWII helmet with the card number. Each image was taken from a black and white episode during the 1965 season. 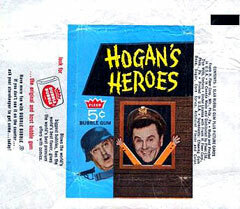 Each card back features a black and white puzzle piece of the Hogan's Heroes characters. Fleer designed these cards in the same format as their Addams Family set from the previous year. 1    Lose a tank Col. Klink? 2    Sir, I regret to inform you that none of our prisoners have escaped. 3    I wish I could see if my shoes were shined! 4    What happened to the girl I was dancing with? 5    I packed your car, General! The ticking??? Pay no attention to it! 6    Anybody would think there's a war on! 7    It's not a tunnel, Klink, we're starting a victory garden. 8    Schultz, make sure the eggs are fresh this time! 9    If we escape...you want to come with us? 10   Col. Klink, in our army you'd be lucky to make Corporal! 11   Watch that first step General, it's a lulu! 12   And I say, we don't need a barbecue pit. 13   Schultz, watch where you're going—you caved in another one of our tunnels. 14   Folies Bergere? I'd like to make a reservation for Hogans Heroes. 15   Open the wine cellar— I got an order for three more cases. 16   Col. Hogan, I've got to keep these glasses on...Klink passed me in the street three times. 17   Klink, I think your sirens sound better. 18   You cook better than my wife! You're better looking too! 19   How do I know...I don't speak German. 20   Carter, how about a game of gin rummy? 21   My son, the P.O.W.! 22   Schultz, next time you need money, come to see me...Don't sell my boots! 23   Col. Hogan, you and your men have 24 hours to return my boots. 24   Col. Hogan, this was a quiet camp until you got here. 25   No! No! Don't take the freeway. 26   What do you mean you cancelled the dance? 27   Klink, you're starting the Christmas party early this year. 28   What gives you the idea that I need a furlough? 29   Put up a road block, my monocle is missing. 30   Don't worry; I'm not a spy. I'm going to a Halloween party. 31   How did I know it was a German uniform??? I got dressed in the dark! 32   Are you the U.S.O. hostess? 33   I swear, you're the first enemy I ever kissed. 34   And boy can I do bird imitations! 35   And this one is the Yellow-Bellied Sapsucker! 36   Explain to Klink...It's not a tunnel; we're digging for clams. 37   I got it as a prize in a cereal box. 38   I caught this in a door. 39   Of course it's a funny hat, but it's great for carrying Pizza. 40   Tell the truth mate, you've got a liverwurst sandwich in there. 41   If I can't have my afternoon tea, I'll shoot my way out of here. 42   I don't think Klink 'll miss either one of us at roll call. 43   Schultz, there's not a strand of barbed wire left in this camp and I'd like to know why! 44   They're not wire cutters Col. Klink. Helga was giving me a manicure. 45   I don't think the prisoners would like it if I brought you with me, Col. Klink. 47   Drink that and you'll be a bushy haired kid again. 48   The door knob has more hair than Klink. 49   It's growing!!! I won't freeze on the Russian front with hair. 50   Definite signs of dandruff. 51   Col. Hogan, I've got the overseas operator on your call to East Peoria. 52   Duck behind Lebeau—Klink will never notice you. 53   Don't ask me, Klink. I don't know whose side Schultz is on. 54   If we get a date for you, we'll make it a double escape. 55   Don't worry—Schultz has cotton in his ears. 56   A boat in prison camp! Please Col. Hogan hide it. 57   Hail, Hail, the gang's all here! But not for long! 58   Ah, what wonderful sauerkraut juice. 59   What do you mean lillies for Col. Klink! Let's get poison ivy. 60   Temper! Temper! You'll fog up your monocle. 61   Why don't you get yourself a windshield wiper? 62   And you didn't think we could make a do-it-yourself airplane. 63   Look at it this way Klink, it beats hiking with a full field pack. 64   Get away you big clown; you're supposed to be a vicious watch dog. 65   I've gained twenty pounds since I started eating your desserts. 66   He told me he bought it with the money from his paper route.